The Accell USB-C to DisplayPort cable transmits high-definition video and audio from your USB-C (also known as Type-C) host computer to a DisplayPort enabled monitor. This USB-C to DisplayPort cable supports resolutions up to 3840×2160@60Hz (including Full HD 1920x1080), easily converting a USB-C port into a DisplayPort output. Compatible with MacBook Pro 2016, MacBook Retina, Chromebook Pixel, and many other mobile devices. The USB-C to DisplayPort cable supports HD resolutions of up to 4K@60Hz for a clear, sharp picture. Use the cable to play games, view video or browse the internet from your USB-C enabled device on a large screen TV. 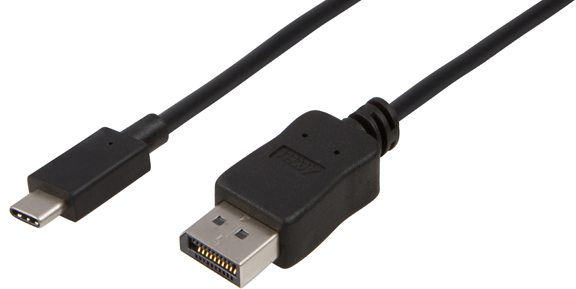 Supporting multi-channel channel audio, the cable provides high-definition digital audio and video. The USB-C to DisplayPort cable supports all USB-C devices with DisplayPort ALT mode and all operating systems, including Mac, Windows and Google. For this USB-C to DisplayPort cable to work from a USB-C port, the USB-C port must support DisplayPort Alternate (ALT) mode. Please check your device's user manual to confirm the abilities of its USB-C port.